Although plenty of butterfly gardeners understand the value of a good nectar plant, a surprising number of them fail to provide resources to accommodate a butterfly’s full lifecycle. For instance, many herbs, annual, and perennial flowers are great fuel sources for adult monarchs on the wing, but when it’s time for females to lay their eggs — which will become hungry caterpillars and, eventually, chrysalides — only milkweed will do. Last year I grew several extra milkweed plants to give to family and friends. When I asked one of them how the milkweed I gave him was doing, he said, “Terrible! Something ate it down to the ground.” Turns out that “something” was a bevy of monarch caterpillars. Once I explained that the milkweed had done its job, his thinking shifted. “I’m going to need a lot more milkweed next year!” he’d said. If the latest estimates are to be believed, we’re all going to need more milkweed this spring as overwintering monarchs head north. According to World Wildlife Fund Mexico, Comisión Nacional de Áreas Naturales Protegidas (CONANP), and the Monarch Butterfly Biosphere Reserve, “Fourteen [monarch] colonies were located this winter season with a total area of 6.05 hectares.” That’s about 15 acres — up 144 percent from last season. Milkweed used to grow prolifically along fencerows and around farm fields, but, with the expansion of cities and suburbs — as well as widespread herbicide use — the host plant has become more difficult for monarchs to find. As a result, if we really want to help save this struggling butterfly species, we need to plant milkweed alongside our other nectar-bearing plants. Ideally, we should have multiple milkweed varieties ready as early as possible, so that migrating monarchs can start laying eggs—and thereby increasing their numbers—right away. 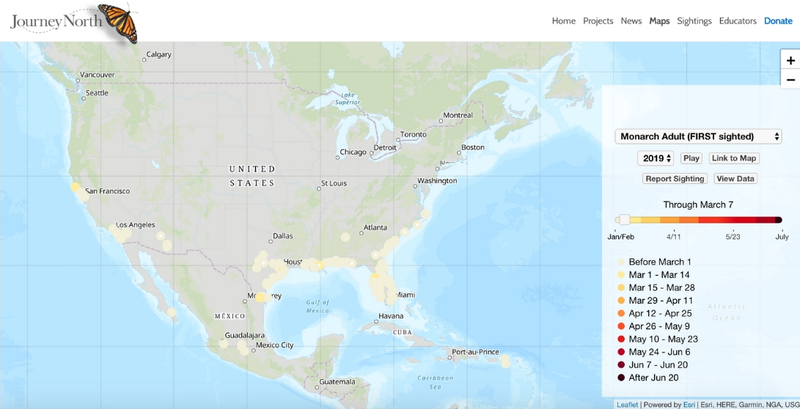 Created by citizen science project, Journey North, the map below shows the location of adult monarch sightings reported so far in 2019. Residents in the southern areas of the U.S. are well-positioned to give monarchs a boost by offering monarchs what they need as early as possible. It’s great if you’re able to start caring for milkweed seeds indoors, but that’s not the only way to get a jump on spring. 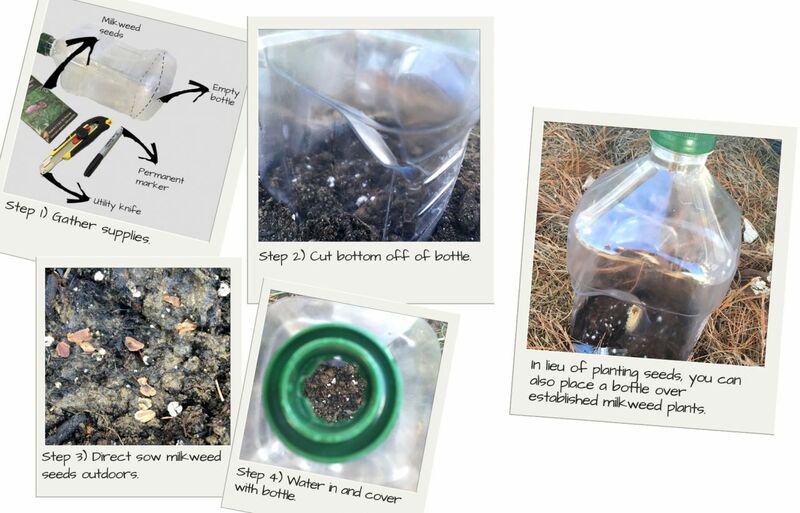 You can repurpose a few plastic bottles to warm up the soil in your planting beds. Large olive oil containers, two-liter soda bottles, or similar clear plastic containers work well. To start, wash and dry your bottles. Next, use a permanent marker to draw cut lines near the bottoms of each bottle. Use a utility knife to cut the bottoms off of each of your bottles. With this method, you can direct-sow milkweed seeds well before the last frost date. Simply prepare your outdoor garden site, plant your seeds, water well, and place one of your containers over the top. To give any existing milkweed plants in your garden a head-start, add compost, water well, and cover. Finally, keep plants and any newly seeded areas moist and covered until the danger of frost has passed. 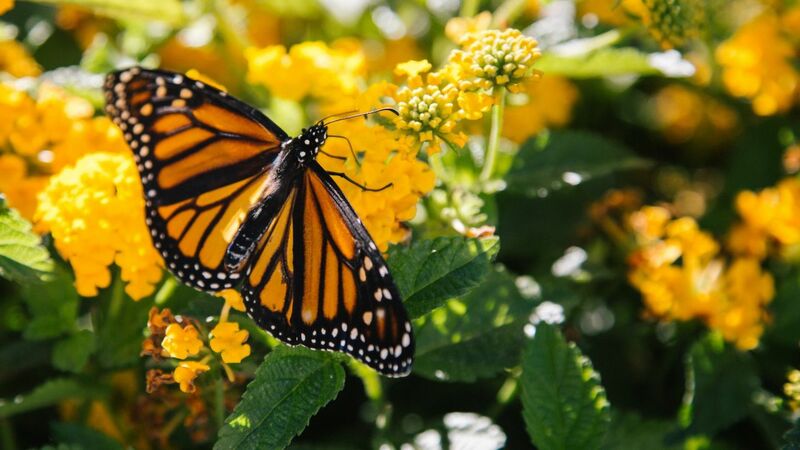 For more ways to get involved with monarch-focused citizen science projects, check out NATURE’s American Spring LIVE hub and the Monarch Larva Monitoring Project, which will be featured in the live broadcast on April 30, 2019.